Reuben-ask: She wants a “great” sandwich. Where to go? 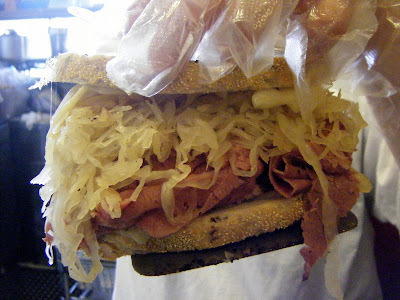 I’m partial to that big boy because I like the deli’s zissel rye, half-sour pickles and the fact that, if I choose to, I can have a “Rachel” rather than a classic Reuben — subbing coleslaw for the kraut. 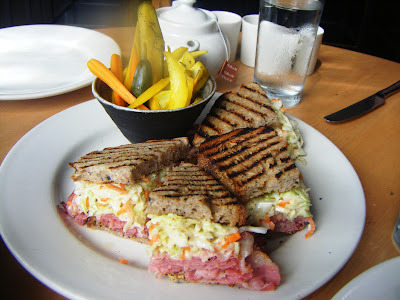 So, help me out here, Eaters: Where do you go for a great Reuben? And don’t say, “the Carnegie Deli” because high-and-mighty though that New York classic may be (I’ve been known to bring one on the plane for the long ride home from East to West), that’s too long a haul for Kathy. And I’m offering up an extra half-sour — and a Dr. Brown’s Cel-Ray tonic — to anyone who can call-out a superior sandwich found north of Seattle-proper, where Kathy awaits your response.